PAUL LIM, Royden Lam, Lourence Ilagan and Noel Malicdem have secured places at the 2018/2019 William Hill World Darts Championship from the PDC Asian Tour circuit. The expansion of the World Championship meant the top four players from the 2018 PDC Asian Tour Order of Merit would be guaranteed a place in the biggest ever World Championship, where 96 players will compete from December 13-January 1 live on Sky Sports. 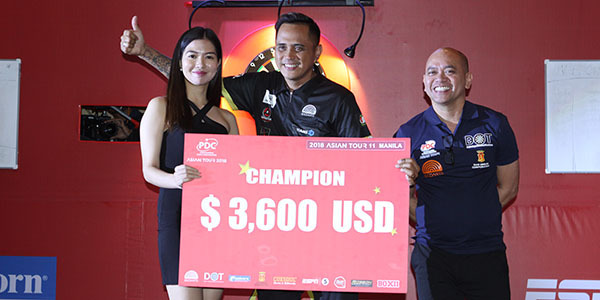 However, second-placed Seigo Asada had already sealed his place in the £2.5 million tournament by winning the Professional Darts Japan Qualifier in Tokyo last week, which meant the top five players following the final Asian Tour weekend of the year in Manila would qualify. Legendary Singapore star Lim, who won his first Asian Tour event in Taipei in September, took fifth spot to book his 11th PDC World Championship appearance, and Hong Kong's Royden Lam took third place. Filipino Ilagan (above) won Event 11, his third Asian Tour title of the year to top the final ranking, while his countryman Malicdem won Event 12 to seal fourth place and a World Championship debut. The William Hill World Darts Championship will be held from December 13-January 1 at Alexandra Palace in London. Click here for ticket information.